Gift and Care first introduced the Epsilon brushes, made by Vie-Long, in 2015 as a Limited Edition. 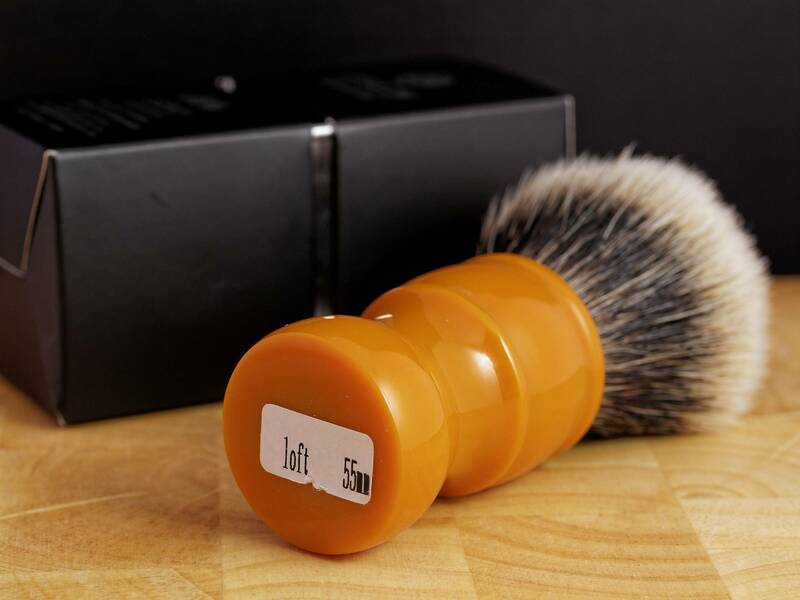 This Chubby style brush was met with much acclaim and I immediately ordered a 2-band, 55mm loft model. The original release had a nice heavy faux-ebony handle with a very dense knot. 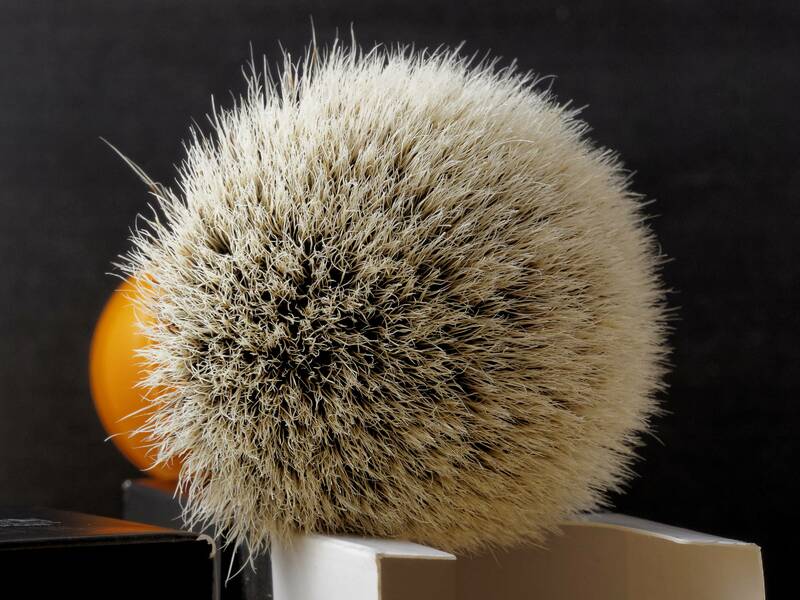 The extreme density of the knot combined with the very resilient 2-band hair ultimately led me to sell that brush, but I did end up buying a 50mm loft Silvertip model which remains in my collection to date. 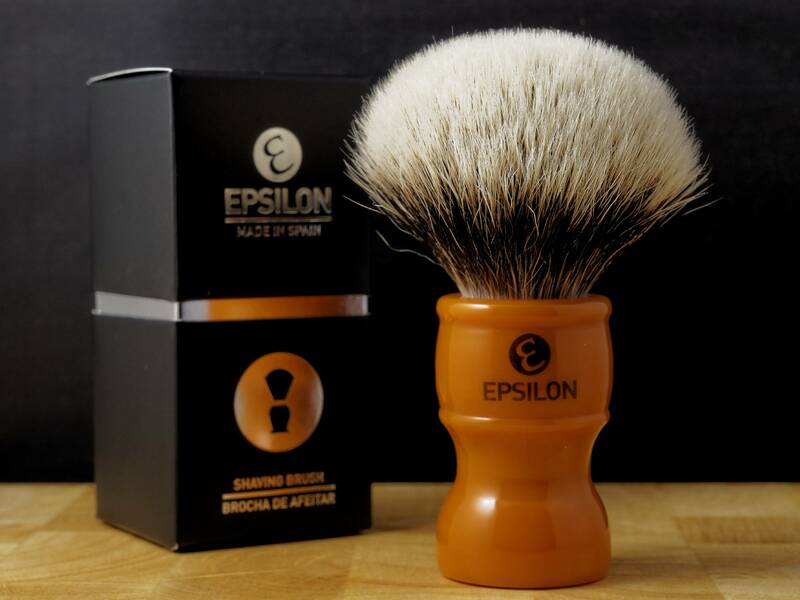 Epsilon has come out with some new handle styles since and none of them really caught my eye, until I recently got an e-mail with this barber-style handle. I ordered one as soon as I saw it. Due to my previous experience with the Epsilon 2-Band hair I opted for the higher loft. Two weeks later my box from Spain arrived with my Floid Black, some pomade, a nice LEA aftershave balm and of course the Epsilon. The box is absolutely stunning with a matte black lower and upper highlighted by a semi-gloss silver band in the middle and matching print. Pulling the brush out of the handsome package I had a few things jump out at me and it wasn't necessarily happy thoughts. First, the knot is substantially less dense than the original release brushes. Second, the handle though more ergonomic than the short and not quite thick enough original, felt lighter than expected. Not a great first impression, but the proof is in the pudding so I put my emotions aside and proceeded to measure and then give it an initial shampoo. The 26mm x 55mm as advertised knot turned out to be 26mm x 56mm (measured dry), that's close enough for me. The handle has a familiar shape that has been made by several brush makers, perhaps the E7 might catch on. The material is a standard resin with a nice butterscotch hue. The rings are pretty subdued and rounded, I think a going a little more aggressive on the rings would have made for a more dynamic look, but perhaps others will appreciate the more subtle lines. The finish is pretty much flawless with the printing intact and no obvious lathing marks left behind, all polished to a nice semi-gloss finish. As mentioned earlier it does feel a bit light in hand, perhaps a less dense material is utilized by Vie-Long. Weight-aside the curves of the brush provide several options for gripping regardless if bowl or face lathering is preferred. I prefer to face lather my soaps and had no problems finding a comfortable grip. The hand-tied knot is well shaped, with only a few stray hairs left straggling above the others. There is a substantial glue bump detectable, extending well above the handle, probably 10-15mm, I didn't bother measuring it. This exaggerated glue bump probably indicates there won't be much difference in performance between the two different lofts being offered other than appearance. Aesthetically I'm happy I chose the taller loft. The density of the knot is what I will call average, not high and not low and definitely nowhere near the monster of a knot from the first brushes to bear this brand. In use, though, it doesn't feel as if it is lacking and is quite enjoyable. The tips are soft, only a very slight hint of scritch is noticeable by my very sensitive skin and even then I really had to focus on the sensation to realize it was there. This is a large improvement over the original brush which had a similar sensation, but on a larger more exaggerated scale, possibly due to the vast amount of hair in that knot. The hair does not have any gel-like qualities and feels very natural, almost like a nice high-thread-count cotton sheet as opposed to a sateen cotton. The backbone of the knot is just right for my preference. I detest moppy, floppy knots and have decided that there is definitely such a thing as too stiff as well, the original Epsilon 2-band brushes would probably be in that category. This brush will splay just a bit when touched to my face, further splay is possible with a little pressure, but the hairs fall right back into position as that pressure is relieved. While this brush is not revolutionary, it does represent an extremely good value and would easily be recommended by me for those looking for a good quality entry level brush. 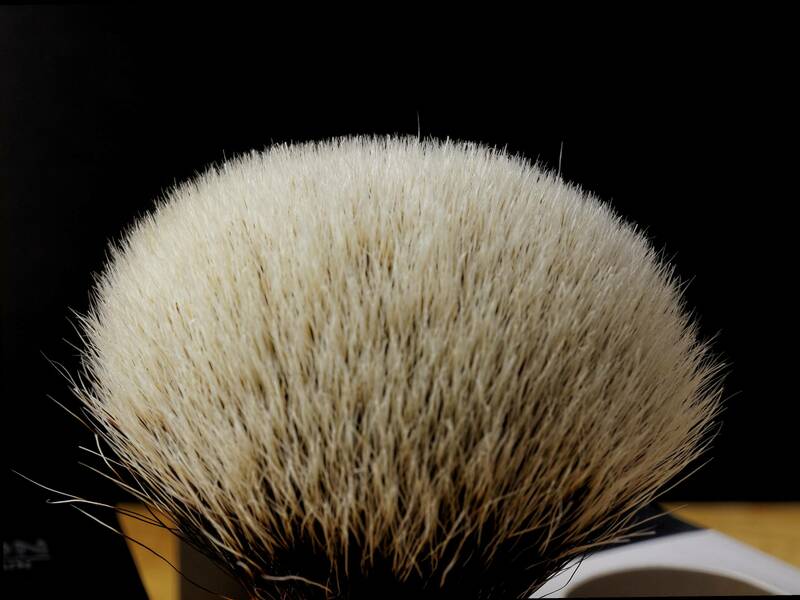 When compared against others in this price category such as the Semogue Owners Club 2-band or a Simpson Best, I think this brush is superior to both. A better comparison might be some of the popular brushes from China and those might be an even better value, but I would rather my money go to a manufacturer with assumable better working conditions. Even though they aren't currently in stock if you are a fan of 2-band brushes, enjoy trying something new, and have some spare change then I would recommend giving one a try. A thoughtful and useful review. Thanks for posting this Dave. Dave, thanks for your impressions. The handle looks to be well done re: carve and color. I'm disappointed to hear that handle heft hasn't improved. The knot seems the standard quality we've come to expect from Epsilon/V-L. I'd be interested in a 3 band option. Thanks for sharing, and enjoy your shaves. Color looks good. Very vintage air about the entire presentation. Honestly a little relieved that they're out of stock. Not sure if I can resist the temptation as easily as the original Epsilon. Hehe. The sorting of the knot looks very nice. The color of the hair looks sort of like vintage silver tip or HMW (of Plisson). I might have to consider getting one. Thanks for the review Dave.